English: "Blessed is the Judge of Truth." Hebrew: ברוך אתה ה' אלוהינו מלך העולם, דיין האמת. 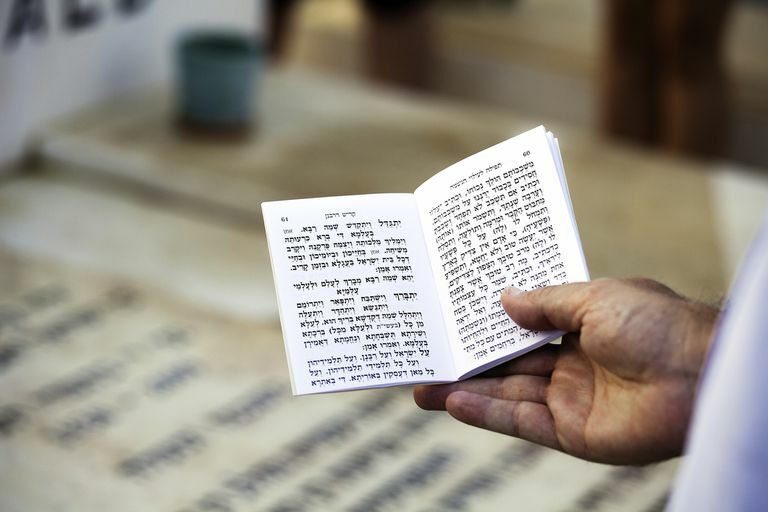 Transliteration: Baruch atah Adonai Eloheynu melech ha'olam, dayan ha-emet. English: "Blessed are You, Lord, our God, King of the universe, the Judge of Truth." Shiva (שבעה‎, literally "seven"): the seven-day mourning period following burial, which includes the first three days. Shloshim (שלושים, literally "thirty"): the 30 days following burial, which includes shiva. The mourner slowly emerges back into society. Shiva begins immediately when the casket is covered with earth. Mourners who are unable to go to the cemetery begin shiva at the approximate time of burial. Shiva ends seven days later after the morning prayer service. The day of burial is counted as the first day even though it is not a full day. If shiva has begun and there’s a major holiday (Rosh Hashanah, Yom Kippur, Passover, Shavuot, Sukkot) then shiva is considered as complete and the rest of the days are nullified. The reason is that it is mandatory to be joyful on a holiday. If the death occurred on the holiday itself, then the burial and shiva begin afterward. The ideal place to sit shiva is at the home of the deceased since his spirit continues to dwell there. The mourner washes his hands before entering the house, eats a condolence meal, and sets up the house for mourning status. The implication from the text is that the blessing of Isaac and the death were related, therefore, the rabbis interpreted this to mean that G-d blessed Isaac by comforting him in his mourning. The purpose of the shiva call is to help relieve the mourner of his feeling of loneliness. Yet, at the same time, the visitor waits for the mourner to initiate the conversation. It is up to the mourner to dictate what he wants to talk about and express. The prohibitions that continue to be in effect from shiva are no haircuts, shaving, nail cutting, wearing of new clothes, and attending parties. Yizkor is said on Yom Kippur, Passover, Shavuot, Sukkot, and the memorial anniversary (the date of death) and in the presence of a minyan. A 25-hour yizkor candle is lit on all of these days. Portions of this post were original contributions of Caryn Meltz.